The University of Florida is home to many interested in research and service projects in the area of network analysis. The Journal Club on Social Networks and Relational Sociology gathers an interdisciplinary group of students, faculty and staff who are interested in social network theories and methods. For more information and the meeting schedule, check out their webpage. 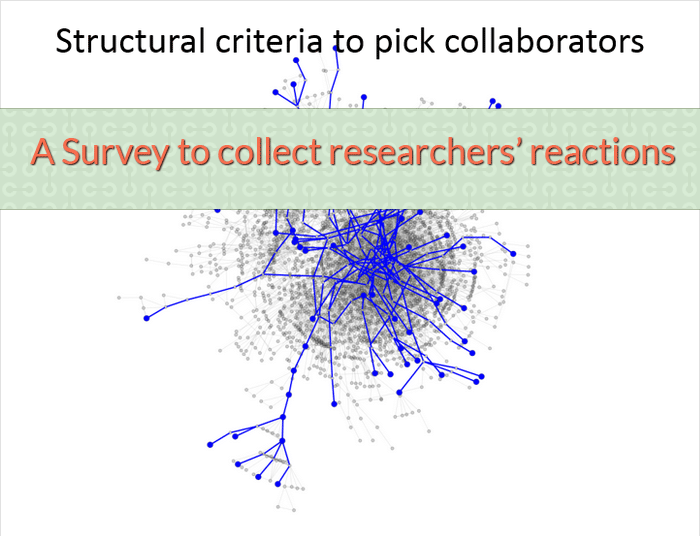 BEBR’s Social Networks program offers personal and professional network analysis and visualization, as well as recommendations for network interventions. 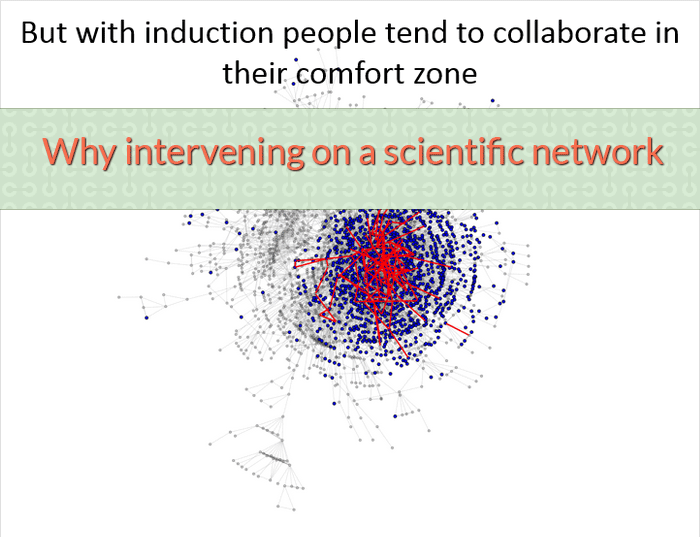 In the area of academic research, collaboration occurs in teams and networks of researchers, and studying these networks helps monitor and drive research productivity at a university. 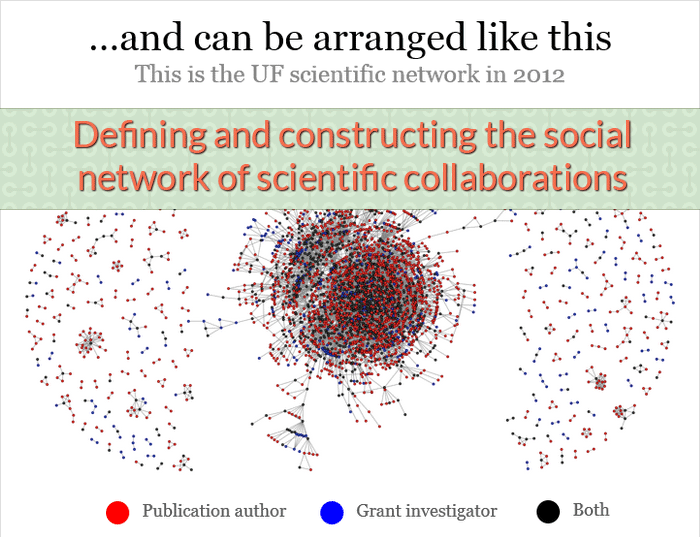 In 2012, BEBR and the UF Clinical and Translational Science Institute (CTSI) started a project aimed at mapping, visualizing, analyzing, and shaping collaboration networks at UF. Since then, BEBR has collaborated with several entities at UF in creating network profiles and network intervention studies. These activities have resulted in several published articles and presentations at international conferences. For more information about the services BEBR’s Social Networks program offers, contact us. As part of a research Project at the Center for the Humanities and the Public Sphere, data on the research interests, collaboration and topics of classes taught by the UF Humanites faculty members was collected. 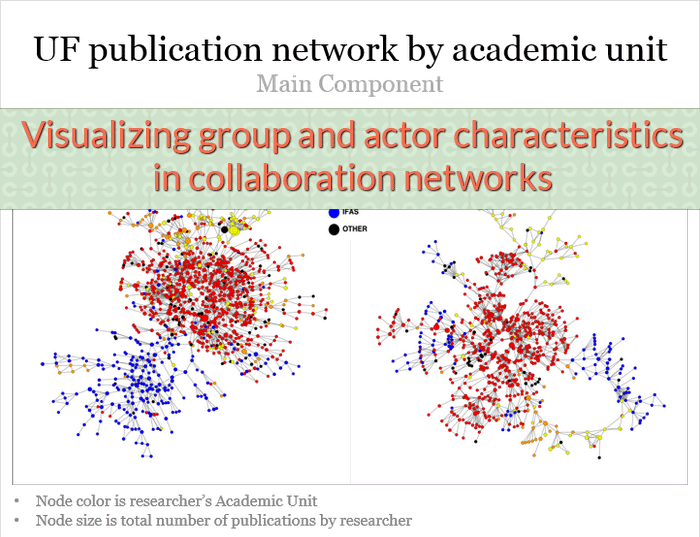 In a joint effort with the Network Science Program team at BEBR, a network profile of shared research topics and co-publications was generated and presented during a meeting of the Social Network Analysis Journal Club at the College of Liberal Arts and Sciences. 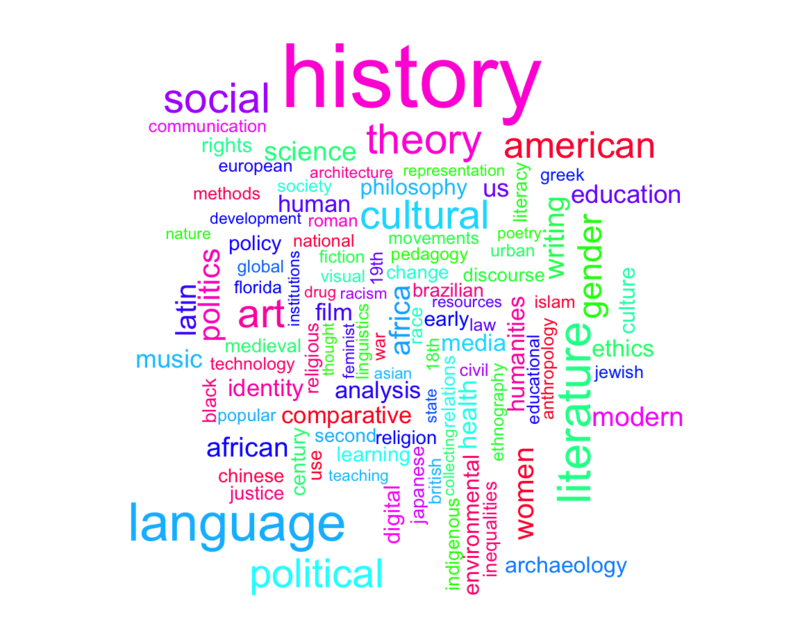 The insights into the underlying social and topical structure are a profound representation of the research and teaching activities within the Humanities, which enable these faculty members to identify and approach groups and individuals for promising future collaborations on shared or neighboring research topics. Members of the Network Science Program at BEBR gave a presentation at the Translational Science 2018 conference on their data analysis and intervention strategies. 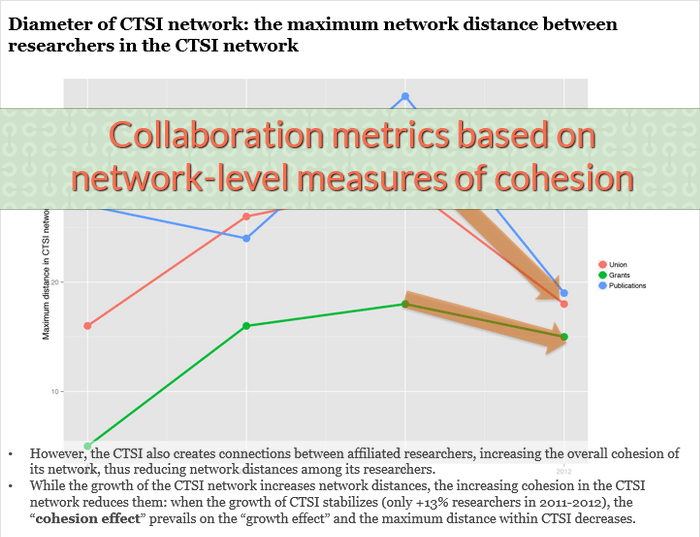 The program aims to expand network science and science of team science at UF, map and analyze collaboration networks across CTSA hubs and design network interventions to stimulate collaborative research at UF and across the CTSA consortium. The research of the program is based on publication, grant proposal, and office space data, as well as membership in PhD committees. 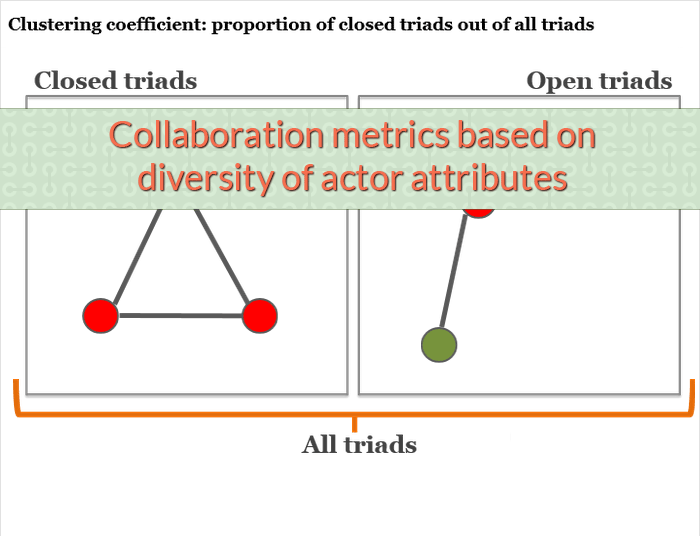 The aim of this paper is to contribute to the understanding of the structural evolution of scientific collaboration networks. 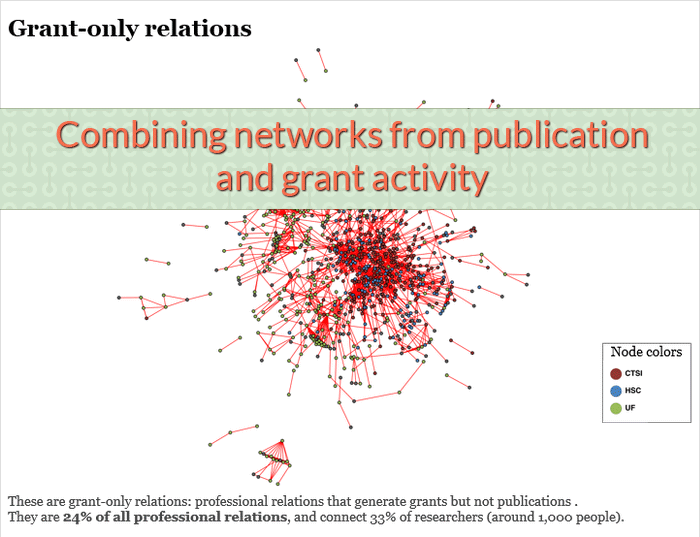 A large body of literature has focused on the structure and evolution of co-authorship networks, typically examining networks within a specific discipline, but spanning different academic organizations. By contrast, this paper narrows its focus to a single academic organization (the University of Florida), but expands the network boundary in two ways: including collaborations among scientists in many different disciplines; and examining three dimensions or layers of scientific collaboration, namely, co-authorship on peer-reviewed scientific articles, co-participation in awarded grants, and co-membership in PhD/Master committees.